Using Intel® Active Management Technology, privileged users can support fully provisioned Intel® vPro Windows systems below the OS level, regardless of the status or power state of these remote systems. To create an Intel® vPro shortcut, click the Create button in the Jump interface. From the dropdown, select Intel® vPro. Intel® vPro shortcuts appear in the Jump interface along with Jump Clients and other types of Jump Item shortcuts. To view the properties of multiple Jump Items, the items selected must be all the same type (e.g., all Jump Clients, all Remote Jumps, etc.). From the Jumpoint dropdown, select the network that hosts the computer you wish to access. The representative console remembers your Jumpoint choice the next time you create this type of Jump Item. Enter the Hostname / IP of system you wish to access. Select the Public Portal through which this Jump Item should connect. If a session policy is assigned to this public portal, that policy may affect the permissions allowed in sessions started through this Jump Item. The ability to set the public portal depends on your account permissions. To set when users are allowed to access this Jump Item, choose a Jump Policy. These policies are configured by your administrator in the /login interface. Depending on your Jumpoint setup, you may be prompted to enter a username and password. The Jumpoint detects the provisioned vPro hardware. If the credentials, provided during either the Jumpoint configuration or the Jump attempt, match the credentials of the vPro-provisioned system, the connection is initiated. Depending on how the vPro computer is provisioned, you may be prompted to enter a user consent code before performing certain actions. If a consent code is required, a pop-up appears on the remote screen. 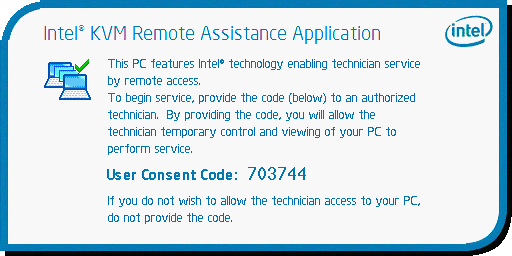 An end-user must provide you with this code before you can gain hardware access. Once the connection is made, you have control of the remote vPro hardware. You can then use the vPro session tools to work on the remote system.